Wolverhampton Wanderers Football Club have inaugurated a Rachael Heyhoe Flint Award to commemorate the huge contribution that the late Baroness Heyhoe Flint made, both to the Football Club in particular but also the City of Wolverhampton. At the showpiece End of Season Awards Dinner held at the Telford International Centre on Tuesday 9th May 2017 the Club announced the first recipient and the Award was presented to Keith Berry by Club Vice Presidents Robert Plant CBE and Steve Bull MBE, both great friends of Rachael. The citation reads “For outstanding contribution to the Community”. Keith is a founder member of two Wolverhampton Charities of which Rachael was a Patron and ardent active supporter. The Birch Thompson Memorial Fund was established in 1981 after the untimely death of two Wolverhampton teachers in the same school, Graham Birch and John Thompson. Rachael worked with John in the early part of her career as a teacher. She was instrumental in providing two minibuses and the replacement of bunk beds at Gelliwig, the Residential Centre officially opened by the Charity in 1989. After 30 years of usage and with the help of feedback from user groups, the Charity has plans drawn up to improve the property that include a mini-sports hall to honour Rachael’s contribution. 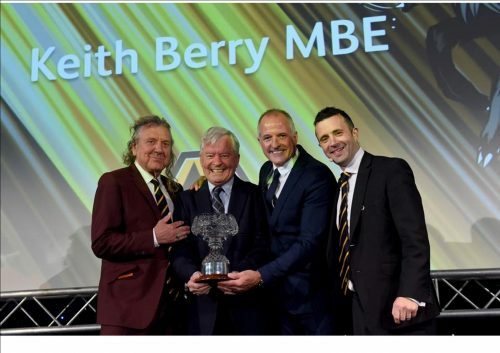 In mentioning the Appeal at the Awards Dinner Keith can now announce that £500,000 is needed to be added to the £130,000 already realised and ring-fenced for this purpose. The other charity of which Rachael was a Patron is POWER PLEAS and in 1995 she started an Annual Collection for Wolves Wheelchair after wheelchair user Darren Langston had asked her if the Wolves could buy him one. Both Rachael and Darren passed away in January, but Rachael’s Day at the Molineux has been promised as an annual event. Sports presenter Jacqui Oatley and Richard Skirrow have succeeded Rachael as Patrons of POWER PLEAS. Keith thanks the Club for their support and in particular Richard Skirrow and Will Clowes and his team in the Wolves Community Trust, supported by Managing Director Laurie Dalrymple.